As Buster Poindexter sang in 1987, it’s “Hot, hot, hot”! Two legged and four legged beings are trying to find ways to cool off anywhere from going to the beach or pool to eating cooling treats. So in honor of cooling off, here’s a recipe for a cool treat that you and your dog can share: Frozen Peanut Butter Treats. Place 2 cups of plain Greek yogurt, 1/3 cup organic, natural peanut butter, one medium banana, and one tablespoon of honey in a food processor and then process until smooth; about two to three minutes. Then pour the mixture into paper or silicon molds, place on a baking sheet, and freeze for at least an hour. Finally, remove the treats from the molds and enjoy with your pup! A good way to help your dog expend some energy is with interactive games. Interactive games challenge your dog to find treats. The games are designed for beginners to more advanced “players” and it’s easy to make the difficulty level higher as your dog’s skills improve. Interactive games help tire your dog out as they are problem solving. When used properly, interactive games can make your dog more tired than a good hike or hours of playing fetch, and as a wise person once said, “A tired dog is a good dog”. 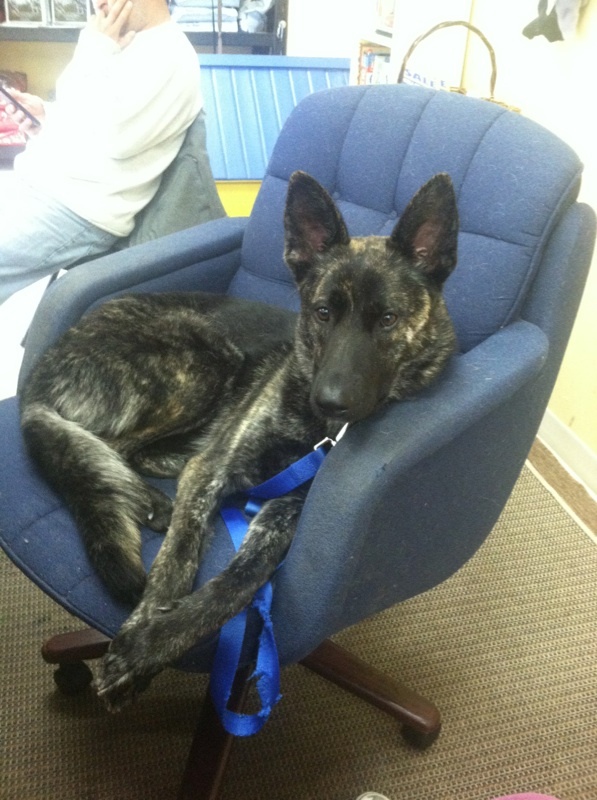 Emily White is a Dutch Shepherd mix that comes to us for daycare. Emily started out pretty shy and unsure with both dogs and people, but she has come a long way. She now plays very well and gets along with everyone. Her best friends are Otis the Great Dane and Hoodie the Labrador. In July we discussed signs (a passive form of communication) that dogs may give that communicate that they need to go out. This month we’ll talk about signals which are forms of active communication; they’re behaviors that the dog performs intentionally to tell you that he/she needs to go out. These signals include scratching at the door, sitting/waiting by the door, scratching/pawing at the owner, staring at/standing by the owner for no reason, barking near the door, and ringing a bell (if he/she is taught to do so). Again, we must be consistent. as always, if you have questions give us a call at 760-739-7299. In July for the 5th year in a row, Steve and I had the opportunity to support and attend the Boys and Girls Club of America Military Youth of the Year banquet held in downtown San Diego. The stress and challenges our military families face, especially the children, can be an incredible burden and pretty scary. The Boys and Girls Clubs of America not only serve our local communities but our Military bases and the families stationed there across the globe. It was a very moving and inspiring event and we were honored to be a part of it. Steve and I also had the chance to meet the Master of Ceremonies for the evening, Lewis Johnson who will be broadcasting track and field at the Olympic Games in Rio later this week as he has for the past several Olympics. 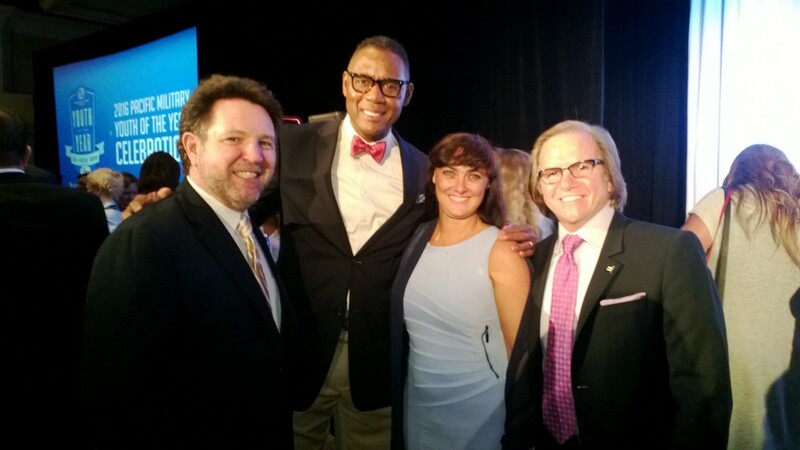 Pictured here with Steve and myself are Lewis and Mike Fasulo who is the president of Sony Electronics in North America and a corporate sponsor and big suppo rter of the Boys and Girls Clubs of America. Over the next few months, you may notice cameras and filming going on at Sandy Pawz Dog House. We are currently filming for a YouTube show about Sandy Pawz Dog House. You may be asked if you’d like to be filmed and it’s completely your choice.If you’re not asked, but you’re interested in being filmed, feel free to tell us so. When the show airs, we’ll be sure to send an e-mail blast with the information so you can tune in. So, smile for the camera!